The process design and operational aspects of a flare system are wide and varied and can range from the relatively simple to the very complex. There are a number of basic process requirements which are normally specified no matter how simple or complex the flare system is. There are also a number of operational aspects that are common to all flare systems. These basic building blocks in the design and operation of the flare system are discussed below. This will determine whether a flare system is low pressure or high pressure, i.e., a sub-sonic flare or a sonic type flare. A flare tip is normally specified with a back pressure of 6.0 barg or less and can be as low as a few millibars for steel plant applications. All flow cases should be designed to vent without exceeding the allowable flare tip or flare system back pressure. Once the type of flare tip has been determined a radiation level analysis needs to be performed. This will generally determine the flare stack elevation or boom length. For an onshore flare the sterile radius and a radiation limit at the sterile radius will normally determine the overall flare height. For an offshore flare, radiation limits at the base of the flare tower / boom, helideck, crane cab, weather deck or other key point locations on the platform will determine the tower height or boom length. For low pressure, sub-sonic flare tips thermal radiation is mostly influenced by the gas properties and wind effects. The design of the flare tip is more often than not, just an open pipe that can’t really aide gas/air mixing and exhibit low radiation unless water / steam / air / gas is used as an assist media. The emissivity factor (or F-factor) ranges between 0.20 and 0.35 for these flares although lower values for hydrogen can be used. With high pressure sonic flare tips the inherent energy and velocity of the gas stream can be used to great effect. Thermal radiation is still influenced by the gas properties and wind effects but equally so by the design of the flare tip itself. There are a wide range of technologies available from Argo such as single point and multi point sonic flare tips and Coanda flares. These flare tips naturally inspirate more air than their low pressure counterparts and exhibit lower radiation characteristics with emissivity factors (or F-factors) ranging between 0.07 and 0.15. This results in shorter flare stacks / booms for these flares. Being able to select from a range of high pressure sonic flares is also particularly helpful when debottlenecking an existing flare system. As well as the type of flare tip, emissivity factors (or F-factors), gas composition and available pressure, radiation levels are influence by other environmental factors such as wind speed and direction, relative humidity, solar radiation and the calculation method employed (e.g. API, Brzustowski and Sommer, Point, Diffuse, Mixed Point & Diffuse, Chamberlain aka Shell Thornton method). Argo uses the commercially available FLARESIM model, from which an appropriate calculation method can be chosen. Radiation Plots: We normally present radiation plots with isopleths 1.58 kW/m² (500 Btu/hr.ft²), 3.15 kW/m² (1000 Btu/hr.ft²), 4.73 kW/m² (1500 Btu/hr.ft²), 6.31 kW/m² (2000 Btu/hr.ft²) and 9.46 kW/m² (3000 Btu/hr.ft²). The different radiation levels represent permitted exposure time of personnel to these radiation levels. Making reference to API RP 521 (Pressure-Relieving and Depressuring Systems). 1.58 kW/m² (500 Btu/hr.ft²) is generally know as continuous full shift exposure, i.e., where personnel with appropriate clothing may be continuously exposed. A radiation level of 4.73 kW/m² (1500 Btu/hr.ft²) would be the limit in areas where emergency actions lasting two to three minutes may be required by personnel without shielding but with appropriate clothing. A radiation level of 6.31 kW/m² (2000 Btu/hr.ft²) would be the limit in areas where emergency actions lasting up to 30 seconds may be required by personnel without shielding but with appropriate clothing. Emissivity Factor: Also known as the F-factor. This is normally calculated by the flare vendor after weighing up each individual case. We always provide the F-factor on our radiation plots and our clients are always welcome to discuss how they are specified. There are various other methods of calculating F-factors based upon tip exit velocity and molecular weight such as Tan, Kent and Cook however these generally overestimate the figure. On occasion an operator will specify a minimum F-factor for all vendors to work to. Relative Humidity: RH is a factor in calculating the radiation incident at specific points. The further away from the flare a point is, the more it will benefit from the effects of water vapour in the air. Where permitted by a client, a Transmissivity (Tau) factor can be applied to calculated radiation levels from the flare thereby reducing overall height or sterile radius. Solar Radiation: Solar is a factor in calculating the overall radiation intensity levels and setting stack heights. It is a common discussion point between flare vendor, engineering contractor and operator where different viewpoints can be held by all three parties as to the inclusion and extent of inclusion of solar in the calculations. Factors affecting its inclusion are; freqency of maximum flare load occuring coincident with maximum solar radiation occuring, likelihood of personnel being exposed at that time and common sense. Maximum and average values depend upon the geograaphical location of the plant (latitude). The range of maximum values is 250–330 BTU/h/ft² (0.79–1.04 kW/m²). The range of average values is 140–230 BTU/h/ft² (0.44–0.73 kW/m²). Once the type of flare tip has been determined the radiation levels and stack height / boom length calculated a noise level check is carried out according to the customer specification. Noise levels are advised if no limit is contained within the specification. Factors mainly affecting percieved noise levels are combustion noise for sub-sonic low pressure flares and assist media such as steam injection nozzles. The factor mainly affecting percieved noise levels is jet noise for sonic high pressure flares and extended flare deck structures can be used to directly shield certain areas below as required. 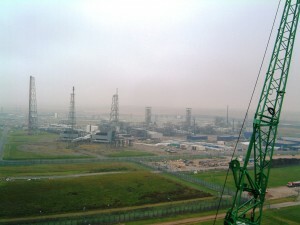 Typically specified values for the maximum noise pressure levels for onshore plant are 90 dB(A) at maximum flaring and 70 to 80 dB(A) for day-to –day continuous operation. Typically specified values for the maximum noise pressure levels for offhore plant are 120 dB(A) at maximum emergency flaring and 70-80 dB(A) for day to day continuous operation. In order to take account off both sonic flare jet noise and combustion noise we can also advise “C” weighted noise levels upon request. Flare Emissions (NOX) etc. by AB.. In order to keep most flares in a safe condition and functioning well there are certain minimum operational and utility requirements. These are continuously consuming power, utility gas and nitrogen so any way the consumption levels can be safely minimised is usually welcomed subject to excessive cost of course. The flare header should be adequately purged with inert gas or fuel gas to reduce the oxygen level down to that required for each individual system. For normal hydrocarbon gas a maximum oxygen level of 6% v/v is adequate, however for flare systems containing significant quantities of hydrogen a much lower level down to 2% v/v may be needed resulting in a larger purge rate. Depending on the size of the flare / riser. Purge rates can vary anywhere from 0.1 Nm³/h for a small flare system up to 500 Nm³/h for a very large flare system. Purge reduction is a high priority for most operations as it contributes to the continuous emissions figures. For onshore low pressure flares molecular seals have been used to good effect to dramatically reduce (by up to 10 fold) the required purge rate, however at the expense of something else such as additional flare tip maintenance. For both onshore and offshore low pressure flares diode type seals have been used to good effect to reduce the purge rate (by 40-50%) when compared to for an open pipe. Starting to become more popular are purge reduction seals for onshore and offshore high pressure flare systems. API 537 provides general guidance on the recommended number of pilot burners required for various flare sizes. Some of the major oil and gas operators have their own engineering specifications, however Argo will always make a recommendation on pilot type, duty and quantity. It is worth noting that offshore flare tips typically operate with larger capacity pilot burners than those onshore due to the harsher ambient conditions. Typical offshore flare pilot capacity is between 70,000 Btu/h and 250,000 Btu/h per pilot. In order to minimise pilot gas consumption where supply may be scarse and expensive some operators use intermittant pilots which are only used if the main flare flame becomes extinguished. Some other uses for utilities include plant air for flame front generators, gas for periodic flare gas enrichment or smoke suppression, steam for smoke reduction and water for water seal top up. Power consumers include electonic pilots and ignition control systems, flame front generators, air assist flare blowers, pilot flame detectors such as UV and IR and aircraft warning lights.